This page keeps you up-to-date on any new articles, posts or updates on Ned Marcus.com. By subscribing you will be notified of any new content in your RSS reader. Click on the orange button below the nav bar to subscribe. Below are the most recent articles or updates from NedMarcus.com. Easter Sale of Blue Prometheus from today (Thursday, April 18th) until Monday, April 22nd. Continue reading "Blue Prometheus is on Sale!" Continue reading "Types of Fantasy"
I've been laid low by some sadistic flu bugs this week, and I've spent most of the week recovering—my excuse for not finishing the article I'm writing. It will come next week, but in the meantime, I'd like to suggest a short story written many years ago by Clark Ashton Smith (which is now in the public domain). He was a short story writer of fantasy, horror, and science fiction, as well as a poet. The Weird of Avoosi Wuthoqquan is a story I've always enjoyed about a greedy man getting his comeuppance. One tip. If you read the story on the website above (and the website is well worth checking, out with most of Clark Ashton Smith's works available there), and if you can't read white text on a black background (like me), then select all (command+A on a Mac), then it changes the black background to a readable sky blue. You can read more about the author on Wikipedia. Enjoy the story! A correction to last week's update. The Blue Prometheus series does actually bear some resemblance to The Lord of the Rings, but only as far as both are portal quest fantasies involving a fight of good against evil. Although people don't always consider The Lord of the Rings to be a portal fantasy, as I see it, it is. The heroes start in a familiar and safe world—the Shire—and travel into the scary magical world beyond. In Blue Prometheus, the familiar world is London, and they then sail a special ship to the planet of Blue Prometheus where they begin their quest. Portal quest fantasies are among my favourites, but I also like intrusion fantasies, that is fantasies where something forces or finds its way from another world into ours. I'm finishing the first draft of the third novel in the Blue Prometheus series (the final in the trilogy). At the moment, I'm up to 92,200 words, and am writing the resolution to the book today—I've finished the main story, and the climax is written. 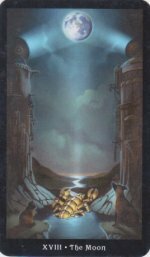 Although the story bears no resemblance to The Lord of the Rings, in the final chapter of that book, The Scouring of the Shire, Frodo and company sort out unfinished business, after defeating their enemy. My heroes, too, must still deal with some unfinished business. Now back to writing it! Continue reading "What is Intuition?" Thanks to everyone who's downloaded my free story, Young Aina, and even more to those who have taken the time to read about this formative experience in young Aina's life. And thanks, too, to those who have rated and reviewed her story.Young Aina has now been downloaded by 1,000 readers on Kobo alone. Blue Prometheus and The Darkling Odyssey follows the lives of three characters—Aina is one of them, an important recurring figure in the books. Unlike Young Aina, Blue Prometheus, The Darkling Odyssey, and my third novel (first draft almost finished—at 78,000 words so far) are told in third person. I hope you enjoy following her story.You can download two short stories about young Aina here or you can download the first story only on Kobo, Amazon.com, Apple and more. All for free! 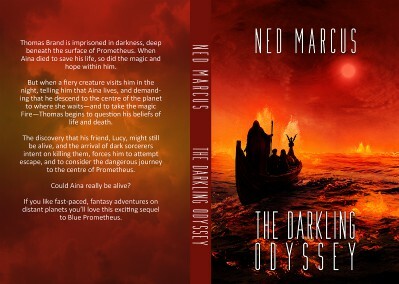 The Darkling Odyssey (Blue Prometheus Series) is now available on Amazon as a paperback. I'm very happy with the new back cover and spine design by Eva Kedves. Continue reading "Intuitive Animal Communication"